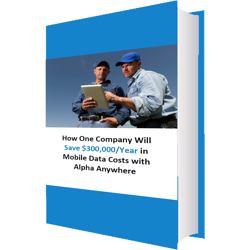 As more businesses go mobile in order to be competitive, one escalating (and sometimes overlooked) cost is inevitable: the high price of data access for mobile workers. But it needn’t be that way! This ROI Study shows how Glacier Water, expects to save hundreds of thousands of dollars by using Alpha Anywhere to build a mobile app with offline capabilities.